Deemed the “greatest painter alive” during his lifetime, Jackson Pollock was an American painter who was a major artist abstract expressionist art in the 20th century. Pollock was expelled from two high schools during his formative years, the second one being Los Angeles Manual Arts School, where he was encouraged to pursue his interest in art. In 1930, he moved to New York to study art, and secured a job under the WPA Federal Art Project, a New Deal project, which allowed him to earn a living from his painting. As he was gaining professional and social success, Pollock fought the addiction of alcoholism and recurring bouts of depression. Two of his brothers suggested Jungian psychotherapy, with Dr. Joseph Henderson, who encouraged Pollock in his artistic endeavors as part of his therapy. Although the psychotherapy did not cure his drinking, it did expose him to Jungian concepts, which he expressed in his paintings at the time. In 1945, Pollock moved with his wife and American painter Lee Krasner to Springs, New York, where he would remain the rest of his life. 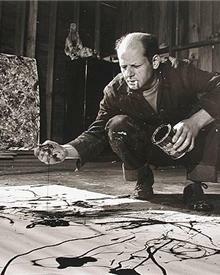 In the barn behind the house, which he converted to his studio, Pollock developed a new and completely novel technique of painting using what he called his “drip” technique. Using hardened brushes, sticks, and turkey basters, and household enamel paints, Pollock squirted, splashed, and dripped his paint onto canvas rolled out over his studio floor. 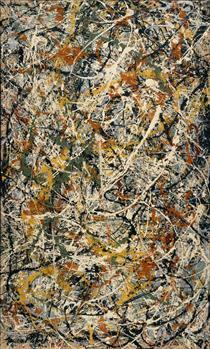 In 1956, Time magazine gave Pollock the name “Jack the Dripper,” referencing his unique style of action painting. 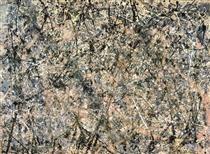 Recent studies by art historians and scientists have determined that some of Pollock’s work display properties of mathematical fractals, asserting that his works became more fractal-like throughout his career. In his later paintings, Pollock reduced the titles of all of his paintings to numbers, in order to reduce the viewers attempt to indentify any representational element in his paintings. 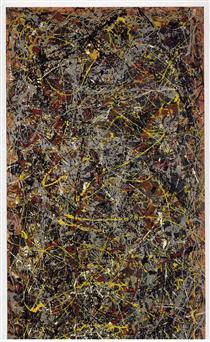 Pressured by his growing fame and demand from art collectors, Pollock’s alcoholism worsened. In August of 1956, while driving under the influence of alcohol, he was involved in a single–car accident, killing himself and one of his passengers. Pollock’s legacy was secured by his widow, Lee Krasner, who managed his estate after his death. His legacy includes a number of references in social media, including songs, poems, books, and documentaries, and the feature film biopic Pollock, directed by and starring Ed Harris. Jackson Pollock (January 28, 1912 – August 11, 1956) was an American painter and a major figure in the abstract expressionist movement. He was well known for his unique style of drip painting. 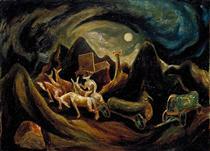 Paul Jackson Pollock was born in Cody, Wyoming, in 1912, the youngest of five sons. His parents, Stella May (née McClure) and LeRoy Pollock, were born and grew up in Tingley, Iowa, and were educated at Tingley High School. Pollock's mother is interred at Tingley Cemetery, Ringgold County, Iowa. His father had been born with the surname McCoy, but took the surname of his adoptive parents, neighbors who adopted him after his own parents had died within a year of each other. Stella and LeRoy Pollock were Presbyterian; they were of Irish and Scots-Irish descent, respectively. LeRoy Pollock was a farmer and later a land surveyor for the government, moving for different jobs. Stella, proud of her family's heritage as weavers, made and sold dresses as a teenager. In November 1912, Stella took her sons to San Diego; Jackson was just 10 months old and would never return to Cody. He subsequently grew up in Arizona and Chico, California. While living in Echo Park, California, he enrolled at Los Angeles' Manual Arts High School, from which he was expelled. He had already been expelled in 1928 from another high school. During his early life, Pollock explored Native American culture while on surveying trips with his father. In 1930, following his older brother Charles Pollock, he moved to New York City, where they both studied under Thomas Hart Benton at the Art Students League. Benton's rural American subject matter had little influence on Pollock's work, but his rhythmic use of paint and his fierce independence were more lasting. In the early 1930s, Pollock spent a summer touring the Western United States together with Glen Rounds, a fellow art student, and Benton, their teacher. 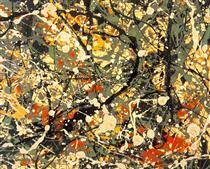 Pollock was introduced to the use of liquid paint in 1936 at an experimental workshop in New York City by the Mexican muralist David Alfaro Siqueiros. He later used paint pouring as one of several techniques on canvases of the early 1940s, such as Male and Female and Composition with Pouring I. After his move to Springs, he began painting with his canvases laid out on the studio floor, and he developed what was later called his "drip" technique.